I don’t usually like to show unfinished paintings, but I’m too excited about this one. I’m seeing so many things that need fixed, but I wanted to share her today, anyway. First, some personal history. My husband is black – African American. And, of course, so are my stepsons. When the boys came to live with us in 1992, I was so excited to finally have a family – as I couldn’t have my own kids. They were ages 7, 10, & 12. We moved to a house large enough where each boy would have their own room – in hopes of cutting down on the rough-housing. (didn’t work, btw) I wanted to decorate their rooms, but guess what? Besides star athletes, I couldn’t find any decor that represented what the kids looked like. Especially in Sacramento in the ‘90’s. Nothing black. No black angels. No black little kids. Nothing. My youngest son’s teachers used to think it was so cute how he would paint & draw everything black – Santa Claus, Abraham Lincoln, whoever. Of course, the teachers didn’t ‘get it’ either, as they were all white and my boys were the only blacks in the school. This was all before I started painting. They were nearly grown by the time I began painting and weren’t interested in me decorating their rooms. Anyone have teenagers? Then you know. In the back of my mind I knew I wanted to paint a series for little black ones. Especially since my kids and their cousins are all starting to have their own kids. This is my first attempt. She needs detail work, but I couldn’t wait to share. I’m working on two other angels, too. Then I’ll do some princesses. I’ve already received a commission for Disney’s Tatiana, The Princess & the Frog. She’ll go on a closet door, replacing the Pooh door I did when the little girl was 2. They are saving the Pooh door, btw. I still have a lot of work to do as far as skin tones. Doesn’t matter whether I do white, black, hispanic or asian – skin tones are toughies for me. I did these two paintings for my nieces. They turned out okay, but they took me For.Ev.Er. Working on painting faster now, leaving it alone, coming back & detailing – which is why Baby Angel isn’t detailed. Okay, I’m off to link up to these great Thursday parties. Dontcha love looking at great crafts & art projects? Check ‘em all out! So talented! You’ve done a great job! Colleen….I LOVE the lil angel. There isn’t enough out there for everyone..you are so right. I adore the painting of your nieces…so lovely. I love the lil angel… so sweet! Your paintings are amazing! I love the closet door. It’s a twist on the movable mural idea. Was that your idea or theirs? PS – I don’t know if anyone has told you this yet, but I have to sign out of my google acct and sign back in before I can comment, otherwise it says there is an error. I’ve noticed this on other blogspot blogs. I’m on Safari, if that makes a difference. I love the angel! So far, she’s adorable! I also like your other paintings. Very nice. You definitely have a gift! Thanks for following and I’m following back! I am loving the Friday Follow! You my dear are very talented… These are so beautiful… Congrats on the commission with Disney!!! 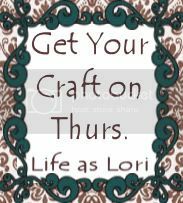 Thanks for joining me for another great party at “Get Your Craft on Thurs.” Please join me next week for another wonderful party..
You are so talented! It must be wonderful to make people so happy with your art! Thanks for stopping by! I’ll be back to see more!